It’s sort of a shame that the story of Andy Carroll’s sporting career will almost certainly be the arc of his failures. Yes, at 21 years old Carroll was selected as Liverpool’s heir apparent to Fernando Torres’s Merseyside throne, and yes, he failed miserably at making that seat his own—in large part because of the constant injuries that plagued his time at Liverpool and his career since then. But the big, top-knotted Englishman was and is still a hell of a striker when happy and healthy, and it’s too bad that the kinds of exhibitions like the two-goal show he put on Tuesday in a 2-1 West Ham win against West Brom will be relegated to his footnotes. Andy Carroll is the prototypical target man in an era in which that role has been severely, if understandably, devalued. When the predominant tactical strategies of the day tend toward single-striker formations, and when the vast majority of the sport’s biggest and best teams dominate possession of the ball as they seek to knife open deep, dense defenses most weeks, the most coveted and respected forwards are versatile ones. The kinds of strikers that thrive today are usually those who score goals, naturally, but also are comfortable dropping deep to pick up the ball, slithering past defenders with agile dribbling, combining with teammates using neat one-twos, using their top-end speed to zip down the wings to look for open space themselves or create room for the other attackers, and any number of additional moves that require more than just a tall frame and a thick skull. However, this preference for many-skilled strikers has some downsides when it comes to properly appreciating those who excel more narrowly. For one, it ignores the fact that there are only so many Harry Kanes out there who can do everything on the pitch, and those sorts of players will naturally get vacuumed up by the world’s big clubs. Thus it’s impractical to analyze, say, Watford’s starting center forward by the same criteria you would Manchester City’s. A worldview that insists that every first-division forward must be just as adept at holding up the ball as he is at playing through balls is one that loses the ability to recognize and marvel at players who still manage to be really good at specific, less-heralded aspects of the game. Carroll is just that sort of player. He’s easy to write off as a mere heading savant by those who don’t watch him play or have ignored him since he flamed out at Liverpool, but to do so is to do a disservice to his impressive, surprisingly wide-ranging abilities. Carroll is, as advertised, a player who’s best skill is his aerial prowess. (Of his 52 career EPL goals, 21 of them came off that big noggin of his.) But Carroll is so goddamn good at heading the ball that watching him do so is a treat nearly on par with the prettiest top corner curler. Most of the time crosses are just about the most boring attacking strategy in the game. Some touchline-hugging full back thumps the ball into the penalty box and you await some burly center back to calmly head it away, with little risk of anything good or even interesting happening in between. But when Carroll is stalking in the box, crosses become dramatic events. Every lofted ball is an opportunity for Carroll to show off his genius-level movement as he ghosts around defenders right to the perfect spot, for him to demonstrate his perfectly timed leaps and his pinpoint accurate redirections of the ball with his forehead. Heading is the least enthralling technique in an otherwise aesthetically pleasing sport, but if any current player is able to take the act of smashing your face into a ball and elevate it into a form of art, it’s Carroll. 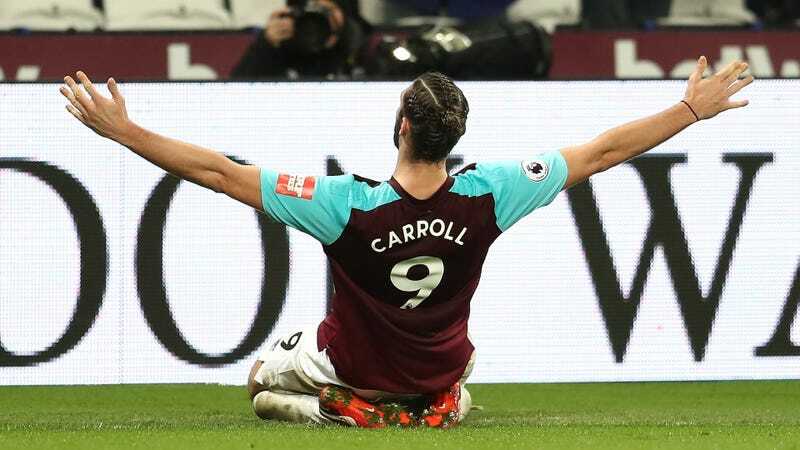 Along with nabbing goals for himself, Carroll also has a knack for the kind of tricky little flick-on passes and short interchanges that the best target men need in order to thrive, and he even manages to set up a decent number of assists when he gets the playing time. The varied roles of the traditional English target man tend to get flattened in this period where all-around strikers are idolized, to the point where the designation of “target man” has become something of a insult tossed at limited big men who can’t move and exist only to wrestle with center backs in the box as they fight for easy tap- or nod-ins. The true target man, the kind that Carroll is, is much more than that, and while it’s not a style of play best served at an elite club like Liverpool, it is without question still a viable tactic for lots and lots of clubs below the elite, and it’s still super entertaining if you watch it with open eyes. The glaring flaw in Carroll’s game has always been injuries. He might have a really solid scoring rate, but because his health is so unreliable, he’s never on the pitch long enough in any given season to rack up numbers befitting of his talent. Carroll hasn’t amassed more than 2,000 total minutes (the equivalent of about 22 full matches) in a single league season since the 2011-12 campaign, and he hasn’t hit the 10-goal mark since 2010-11, the season he left Newcastle in January to make his big-money move to Liverpool. He’s only 28 years old, and because of that and because his style of play isn’t so predicated on raw athleticism, he potentially still could put together a healthy season or two where he maximizes his talents. That may be a long shot at this point (in no small part because he’s probably second- or third-choice striker at West Ham right now even when healthy, and his two goals against West Brom were his first goals of the season), since he’s yet to demonstrate the ability to stay off the training table and on the field for an extended period of time. But regardless of that, as long as he’s still in the league, still fit, and still getting at least the odd start here and there, he’ll always have the ability to dominate a match with his one spectacularly dominant skill and the others that compliment it. And that’s more than enough to make him, and players like him, valuable additions to the game.